Catch up on the previous installments of the history of the Joplin Union Depot here: Part I, Part II, Part III, and Part IV. Despite the progress made in December of 1910, work came to a sudden stop in the first week of January 1911 due to a snap of extreme cold weather. The approximate forty men at work on the depot building had to lay down their tools and watch the skies for better weather. The stop was short, however, and by the end of the month work was well on its way. 1/6th of the grading was left to be completed with only an estimated 25,000 yards of dirt remaining to be used to flatten the depot yards. 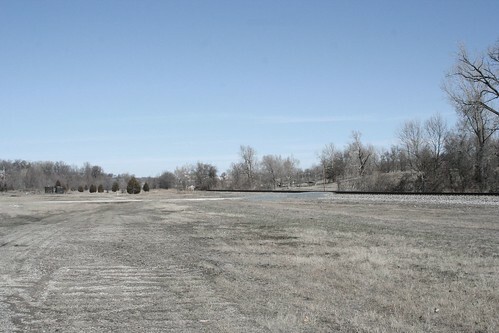 Already 125,000 yards of fill dirt had been brought to the depot, mainly from cuts made by the Kansas City Southern between Joplin and Saginaw. The hills and hollows of the Kansas City Bottoms were filled in or leveled off to create the needed flat surface for the depot's many tracks. “Few residents of Joplin fully appreciate the magnitude of the new union passenger depot, now rapidly nearing completion at the corner of First and Main Streets. Its location at the foot of a gently sloping hill, some 100 yards from the intersection of the streets, combines with the style of its architecture to make it appear smaller than it really is. The building is 300 feet long and 80 feet wide. These dimensions are more significant when it is remembered that 300 feet is the length of a city block….Built of reinforced concrete throughout, the depot is absolutely fireproof, and its walls are thick enough to bear the weight of several additional stories if they should be desired. At the same time, high ranking officials from the Santa Fe Railroad visited the depot site. 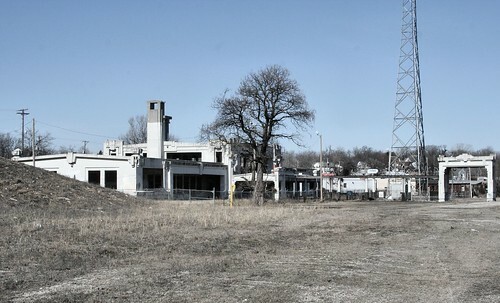 A vice president of the company was quoted, “I have heard so much regarding the Joplin depot that I was anxious to see it…” The article noted that the vice-president was pleased with the depot, its progress, and its location, which would serve as a stop for the railroad on its way south to Arkansas. “Let the eagle scream in Joplin,” announced a member of the City’s council in April, upon a motion to hold a celebration to recognize the completion of the Depot on the Fourth of July. In connection to the decision of the City Council, Mayor Jesse F. Osborne appointed a committee to work with the city’s Commercial Club on planning the gala. A ball, it was believed, should be held that night inside the depot with officials from every railroad invited to attend while a celebration at Cunningham Park earlier in the day to celebrate the nation’s anniversary. Curiously, an article on the matter refers that it was not the custom of the city, but surrounding cities, to hold such celebrations on the Fourth. Hastily, doors had to be relocated from the south side of the depot to the north. With construction otherwise subsiding, thought was finally given to the preparations of the grounds of the depot. The churned soil, “a sea of red clay, sticky as fish glue,” would soon be transformed into flower beds and grass plots. The excavation of the hill upon which Main Street was to the west and Broadway to the south had resulted in an area described as “great amphitheater” and an article bragged, “This land…will probably be used for a depot park…” and believed that no other depot in the country compared for its potential to be developed. The article noted that the best tailings for the project came from mines stratified with steel blue flint. The paper also reminded the reader of how much the Kansas City Bottoms had been transformed by the depot’s construction, “The new station is built on filled in ground in a district which was a waste of sluggish waters, dotted with dense growths of willows. For years this tract, of which 30 acres have been taken over by the Union Depot Co., was the city’s dumping ground. A sickly stream, carrying filth of every kind, crawled through the swamp. The Depot Co. has changed the course of this stream so that it no longer touches the station grounds. Hundreds of carloads of boulders and dirt have been used as filler.” Another, later article also extolled the depot which, “occupies a strip of filled in land that was an eyesore to the community for years. The building of the station and the filling in of the old swamp has converted a weed-grown bottom land into a beautiful valley, level as the floor of a dance hall. All the old swamps and marshes have been filled in, the course of Joplin creek changed so that it flows on the east side instead of the west side of the Kansas City Southern tracks, and when the grounds are finally finished and planted in blue grass, flowers and trees, they will be picturesque.” The landscape was forever changed and in the opinion of the people of Joplin, for the better. By the end of construction of the Union Depot, much of the Kansas City Bottoms had been physically erased from the landscape of Jopin. Regardless of the delay, fifteen officials from the various railroads behind the depot met at the Connor Hotel. The meeting was for the purpose of discussing the various contracts between the railroads and to discuss the details of the depot’s opening. Station appointees had been made in the previous two weeks. Shortly thereafter, it was reaffirmed that July 1st would be the opening day of the depot. Comically, over a week later, it was realized that the Santa Fe railroad would not have a train available to enter the depot until July 15. Accordingly, the official opening was postponed yet again to July 20. However, the depot would accept trains before then. In preparation for the celebration, former Missouri Governor David R. Francis was invited to be the guest speaker. And, like the continually shifting opening day, the invitation fell through when a telegram alerted the organizers of the celebration that Governor Francis had departed from St. Louis for the summer and would not return until fall. Meanwhile, the Depot construction had spurred construction elsewhere. Across the street from the depot on Main Street three buildings were under various states of construction. J.C. Jackson was the owner of one and had erected a three story building at a cost of $20,000. It was hoped the lower two floors would be home to a restaurant and the third a hotel. On the north side of Jackson’s site, Charles W. Edwards owned a lot and planned to build a four story building. The excitement of new buildings was quickly to be overshadowed by an even more exciting event back across the street. One of many ads placed by the railroads in the Joplin newspapers to alert travelers of the pending opening of the depot. The day before the arrival the Depot had been a scene of organized chaos as depot employees and officials had moved into offices and set to work preparing for business. Amongst them were most likely employees of Brown Hotel & News Company, such as F.P. Leigh, the general manager, who was in charge of running the dining room and lunch counter. Leigh was also assisted by a “corps of pretty girls.” Meanwhile, the formal opening was currently set for July 20, still. The highly anticipated Fourth of July celebration had also failed to coalesce. Officials in charge of Cunningham Park had protested the planned use of the park and the City Council immediately had surrendered. Perhaps from unreported blow back, the park officials changed their minds, but the City Council’s chief proponent of the celebration, Councilman Phil Arnold, had resigned his place on the city’s planning committee and the idea of a Fourth of July celebration was unceremoniously set aside. 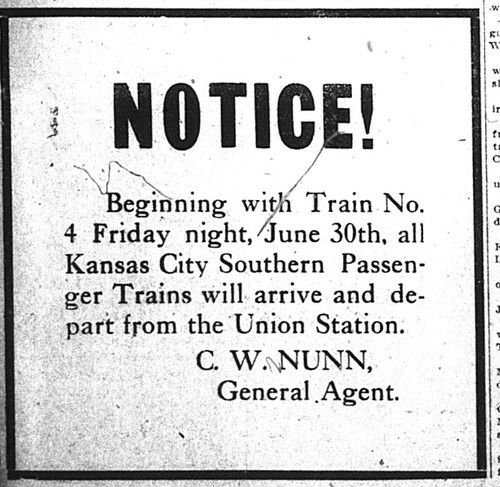 While preparations continued for the formal opening, such as the Missouri & Northern Arkansas planning special excursion trains to Joplin from as far as Seligman for the opening, other events were afoot. One such event was the visit to the Depot of the president of the Missouri Pacific Railroad. Dutifully impressed, the president implied that his railroad may abandon their old Joplin depot in lieu of the impressive Union Depot Station. Finally, at 2:30 pm on July 20, 1911, a parade of Joplin’s finest began under a drizzling rain from the intersection of 20th and Main Street. The procession was led by a vanguard of twenty mounted members of the Joplin Police Department with Joplin Police Chief Joe Myers and his assistant chief, Edward Portley at the front. Planned to follow, though not noted in an article printed afterward, were members of Joplin’s labor unions, secret societies, and civic societies. Among the noted was a procession of the city’s “fire automobiles” and more than thirty other automobiles set to carrying officials from the railroads. Members of the Commercial Club were present, as were four cars with members of the South Joplin Business Men’s Club and another with officers of the Villa Heights Booster Club. 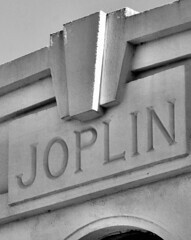 From July 1, 1911 to November 4, 1969, the Union Depot served the city of Joplin. Over the fifty-eight year span, it was at the depot that Joplin saw her fathers, brothers and sons depart and hopefully return from two world wars. It was in the shade of the depot’s awnings that families bid farewell to friends and fellow family members who were departing for the wider world beyond Joplin’s city limits, and it was where they stood in eager anticipation for their return. For a city that foresaw Joplin as a great metropolis positioned at the intersection of the Great American Plains, the Southern Ozarks, and the Southwest, it was one more proud achievement to count among its others. It was one more step down a road to a brighter future. In the March of 1949, the Kansas City Southern showed off its latest liner, the Southern Belle at the depot. Just over twenty years later, it was the Southern Belle which pulled away, the final train to leave the Joplin Union Depot. The following decades of the Twentieth Century were turbulent for the former pride of Joplin. 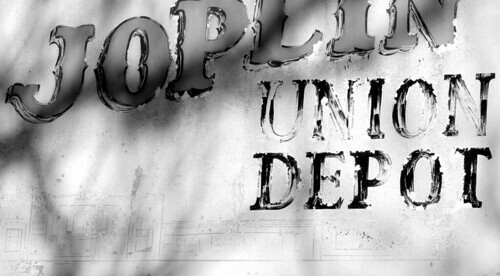 Only three years after its closing, the Depot’s first chance to become relevant again in the daily life of Joplin was lost when the City Council refused to renovate the building as a home to the Joplin Museum Complex in honor of the city’s 100th birthday. Not long after, the depot was added to the National Register of Historic Places, an honor, but not a safeguard against demolition. 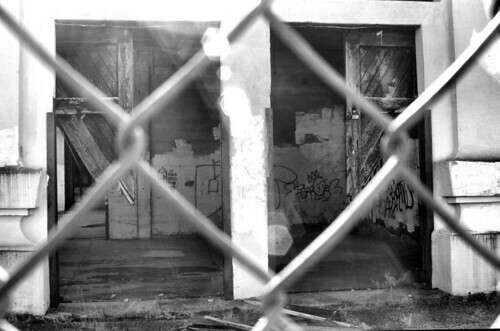 The depot next was passed from one speculative buyer to another, each espousing plans to put the building to use which inevitably always failed to materialize. In the mid-1980’s, an attempt was made once again to renovate it, but it dissolved into lawsuits and accusations. Finally, in the late 1990’s, the Department of Natural Resources bought the site. 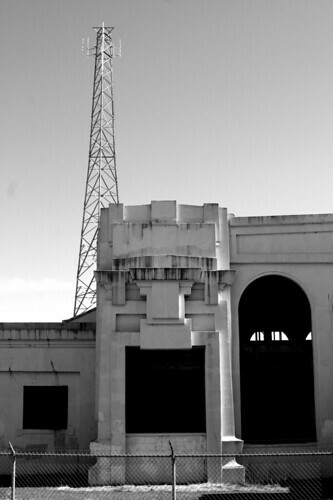 It was not until approximately 2009 that for the first time the depot became the subject of serious discussion regarding renovation and restoration. In 2010, City Manager, Mark Rohr, proposed a plan to use the depot as part of a north Main Street development, possibly as a new home to the Joplin Museum Complex (JMC). Despite resistance from the boards overseeing the JMC, steps were taken toward this ultimate goal. However, at the start of 2012, such talk has been replaced by more important and pressing matters that arose in the aftermath of May, 2011. Until the time that they resume, the depot remains enclosed behind a chain link fence, waiting for a chance to once again become the pride of Joplin. This page took 0.205 seconds of computer labor to produce.